I'm Rebecca. I talk a lot, about anything but mostly about books. You can also find me @ my blog Garrulous and Bookish. I also post bookish videos on my Youtube channel. 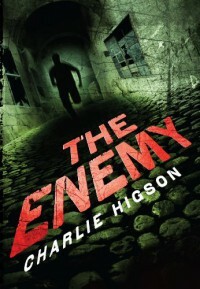 The Enemy is about a group of children (ages 16 and under) who are the only survivors of a terrible disease that has turned the adults into decaying, cannibalistic monsters. They are making a journey from their home (at a supermarket) to Buckingham Palace where, there are told, there are other, better organized, kids. The journey is dangerous and the destination uncertain. Will they be able to overcome the obstacles and stick together. I really liked this book I felt like the story kept moving and there wasn't any drag in the story because the third person perspective was always changing- going from character to character. The characters were well written and relateable- they were tough but vulnerable, most of them fighting for their spot in their large blended family. The grown-ups are gross and scary- just the way monsters should be- they are stupid but evolving, becoming more dangerous as time goes on. Another plus for me was the ending- mainly that it had one- some books with sequels just end without warning midsentence, midthough mid-whatever. There is room for more story and of course I want to know what happens to the kids next but this part of the story is over. I plan on reading the rest of the book in this series.